Asgar-Oladi : The problem of Musavi and Karoubi is a lock if not opened will become problem for the coming election ! Habibolah Asgar-Oladi is a powerful follower of Khomeini during the regime of Shah who have spent years in prison before revolution and was appointed as International trade Minister after the revolution and a strong man of Bazar ( Persian classic Market). 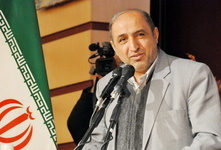 In recent months he became critical to the regime on the issue of Musavi and Karoubi's house arrest and he believes that Karoubi and Musavi aren't part of the " Fetneh" or ( sedition) in 2009 Iranian people's uprising against presidential coup.On March 26 he said again: "The issue of Musavi and Karoubi are like a lock if not opened will cause problem for the coming presidential election." 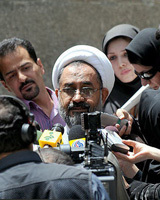 his comments brought many pro-con discussion in the Islamic Republic medias. Preparation of the Ministry of Information of the Islamic Republic regime in Iran for the coming presidential Election in June 12,2013 ! 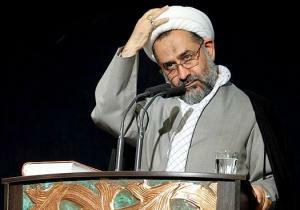 According to "Aftab News " website , Clergy Heidar Moslehi Minister of Information of the Islamic republic regime in Iran , today during Government cabinet members meeting said: "Presidential Candidates must consider ( Follow) the red line installed by the regime about presidential election in order to have an election towards the goals of the Islamic revolution." In response to a question he added:" Our Ministry have prepared plans and programs for the coming presidential election and with the help of people, we will carry these actions and plans. " Islamic Regime in Iran Likes to Magnify & Blame Western World on Internet Speed Reduction ! 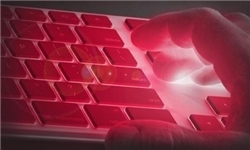 While Iranian getting closer to the Presidential Election in June 2013 and the reduction of Internet Speed by Islamic regime in Iran reached to almost Zero to None for Iranian internet users, regime magnifies a report by British newspaper Independent about the internet speed reduction due to Cyber attack. Regime is magnifying these kinds of news because Iranian internet users are already complaining for low internet speed.Regime is taking cautious steps for this presidential election to reduce the damage was done during 2009 presidential election by Iranian bloggers and internet users. After presidential election coup by regime during 2009 uprising in Iran thousands of amateur video were uploaded in Youtube and people around the world can still see these videos. 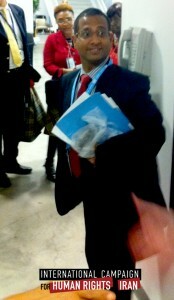 Representative of Canada in " Wet Gunpowder " International Congress in Iran !? According to a report by " Fars News Agency " ;representative of 28 countries including Canada attended in an International congress known as " Baroote Kheis" or "Wet Gunpowder " organized by Islamic Republic in the Southern province of "Khouzestan" of Iran . The congress was organized by a council and " Sardar " or Commander Yaqoub Soleimani is its member . The congress is going to be held from today March 28 to Saturday March 10 in " Shalamcheh " Area . Masoud Lavasani Iranian Journalist who have escaped Iran in Recent Crackdown on Journalists in Iran, In a Letter Requested from all Journalists and Human Rights Organizations Around the World to Help Him ! I’m Masoud Lavasani ( Seyed Masoud Hoseini Lavasani ) Journalist & activist against censorship in Iran. I have worked more than ten years in print & cyber media. During my media activities ,I have been time and time threatened , assaulted and persecuted by security & censorship organizations . Before the year 2009, many times I was threatened for arrest and two times through pressure from Censorship organization , Ministry of Guidance and “Sepah “ forced my employer to expel me from my job. 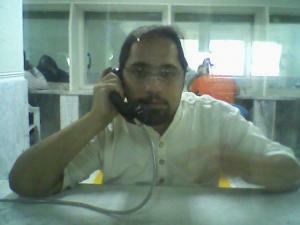 In September 2009 I was arrested by “Sepah” and more than 40 days I was under intense interrogation and torture. I was tortured two times by electrical shock and was assaulted and beaten ( In a way that my neck was severely hurt and went under operation for cut in neck muscle ). They strike blow on my testicles . I was under severe pressure to confess that I had sexual relation with my co-employees and I was tortured many times to go in front of camera for unfounded confession against myself. At last in the first court I was sentenced to eight and a half years imprisonment and was also deprived the entire of my life from practicing journalism. This is while, the court was told that my charges were the written subjects in my blog and contrary to the Islamic law there were no jury present at my trial ( Based on Islamic Republic’s constitution the media trial must take place in media court with the presence of media law, while I was tried in a security court and under the influence of Sepah ( Revolutionary Guards). During my entire imprisonment and until the moment before trial, I was unable to talk to my lawyer and thereafter until preparation of my defence arguments ,I never had permission to meet my lawyer. 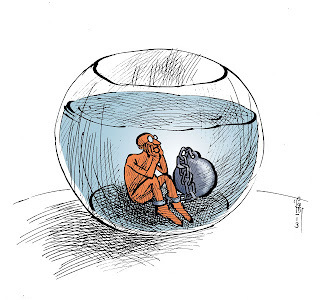 Months after my imprisonment , many times because of my protest about the countries situation ( media censorship, ban on newspaper , journalists arrest and…..) , time and time I was not allowed to see my family members by judiciary power of the Islamic Republic. In the spring of 2010 in protest to the inhuman condition of the political prisoners, I went on hunger strike together with Mr. Eisa Saharkheiz other imprison journalist in the Islamic Republic prison which resulted other journalist around the world joining us in protest. 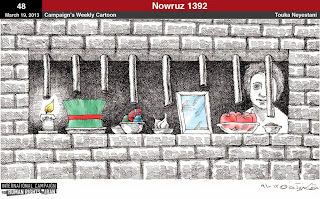 During my imprisonment , because of the bad condition of the Evin prison and torture , time and time fell into acute illness, smallpox ,sever nervous breakdown , temporary blindness, heart attack and…….. In July 2010 ,I spent one month on a bed in an isolated room. In September 2011 after 24 months imprisonment and with a sentencing of 10 years prevention from practicing journalism profession ,I was released from prison and was hospitalized for neck operation which was an injury during my imprisonment . In January 2011 my wife together with doctor Said Madani and Ehsan Houshmand were arrested in a wave of journalists & blogers arrest and was detained for a month in Ward 209 of the Evin prison. Following the arrest of my wife in connection with “Ghalame Sabz” newspaper ( Green pen newspaper) ,I was also interrogated in front of my little boy for 10 hours . Following that, time and time I was summoned and interrogated by security forces for signing petitions in support of journalists. My wife was expelled from “ Hamshahri “ newspaper where she was working and with pressure by security forces I was also unable to work with a cinema & TV producer. In March 23rd 2012, I was arrested without warrant of arrest by judge and kidnapped in the streets of Tehran and was kept in an unknown detention for two days. Telephone summoning and continues thereat against my family members by security agents were unbearable. 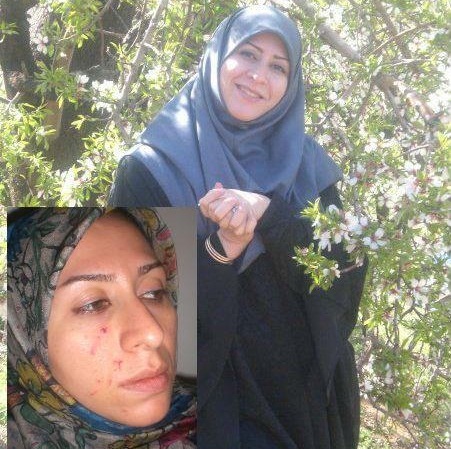 In December my wife together with our child were assaulted and she was wounded by security forces while walking on the side walk. The police forces of the Islamic Republic didn’t follow the complaint my wife made against the assailants. (IRAN WATCH CANADA : This was translated and reported in IWC ). During the new wave of Journalists arrest which happened at night, with an attack on the offices of four Newspapers and two magazines ,the forces of the Ministry of Information attended at my house to arrest me too , but I wasn’t home and not arrested . From that date on , I didn’t go home and started an underground life in Iran for a few weeks with the hope that they won’t come after me, but with their return to my home again , I decided to leave the country . During this time, the ministry of information in a statement mentioned about my underground life and escape from the country and when the interrogators of the Ministry of Information contacted my home , it was told that I left the country. Well, in short ,since the Government security and censorship organizations didn’t like my media activities in the past years ,they tried in different ways to hurt and assault on me & my family. The 10 years sentencing banning me from media activities was more hurtful than the 24 months imprisonment and torture, because , they have targeted directly on me and my family’s rights to live. With the increase in assault and bothering by the Islamic Republic security forces and threat on my life and had no the choice but to leave Iran. I ask from all conscientious people to echo the voice of my oppressed family. My little boy who passed two years of his little life without father and time and time witnessed his father and mothers arrest and even he himself witnessed the assault by interrogators in Evin prison , today is deprived of his least human rights. My son was two years on speech improvement treatment and today he faces many challenges. Today the security of me and my family’s life and economic and mental health is endangered in Iran and now that i have left Iran without any other choice , my only hope is support from my professional colleagues. Hoping for the release of all imprisoned Journalists . Hoping for the removal of all kinds of Censorship against Free Expressions. And hoping for good days for all humans. Attempt on the life of a journalist in Iran ! On the evening of Thursday Jan.24 Fatemeh kharadmand a reformist journalist and a supporter of Green Movement was walking at around "Shohada" Square in Tehran with her son ,when unknown motor cycle riders attacked on her in sidewalk. According to Kharadmand, she saw a motorcycle got into the sidewalk and drove straight at her and her little son ,but when the driver failed to do their intention ,stopped the motorcycle and the woman passenger of the motorcycle attacked on her and escaped when the people tried to go after them . In the past Fatemeh Kharadmand was arrested and detained for her support to Green Movement and Musavi.Fatemeh is the wife of imprisoned journalist Masoud Lavasani the editorial member of " Ghalame Sabz" Newspaper. Dervishes Are on Hunger Strike in Islamic Republic Prisons ! 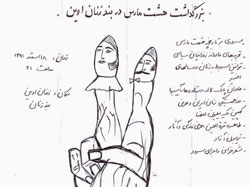 Imprisoned Gonabadi Dervishes in Ward 350 of Evin prison, Ali Reza Roushan and Mostafa Abdi have gone on hunger strike since the first day of Farvardin 1392(March 21 2013). Today, 5th Farvardin, 1392 ( March 25, 2013) in the morning, Messrs. Roushan and Abdi during a visit with their families, by expressing concern about conditions of jailed Dervishes have stated: "Though we would beg them to end their hunger strike, we seek also their path and have decided to embark on an indefinite hunger strike as a sacrificial mark of protest against violation of law by Iranian Judicial authorities. It is notable that the worried families of Saleh Moradi and Kasra Nouri, by expressing grave concern about deplorable conditions of them said that, Dervishes are on the verge of death now! 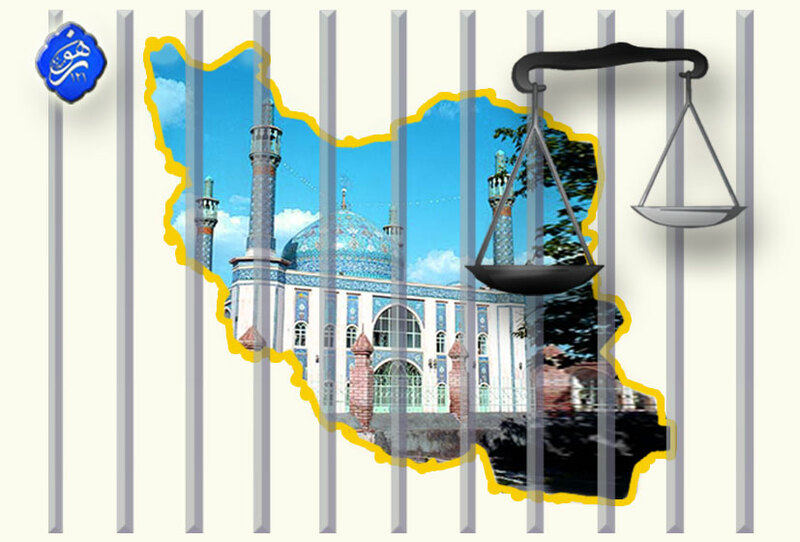 and the Iranian authorities, specifically Judge Salavati and Intelligence Ministry will be responsible for any risks to their lives as a result of their ongoing hunger strike because the Iranian Judiciary officials have not yet reached to their simple demands after 69 days. It should be reminded that, seven Gonabadi dervishes's lawyers and Majzooban Noor's managers (Messrs. Hamid Reza Moradi Sarvestani, Amir Eslami, Mostafa Daneshjou, Farshid Yadollahi, Afshin Karampour, Omid Behroozi and Reza Entesari) because of refusing to participate in court due to illegal process hearing, under order from judge Salavati, have been transferred to solitary confinement of Ward 209 Evin prison from more than 70 days ago. It is regrettable that, Gonabadi dervishes were mistreated, beaten and insulted at the time of transfer and interrogation. Unfortunately physical condition of two Dervishes has been reported deteriorated. The Council extended today its scrutiny over the deteriorating situation in Iran by renewing the mandate of the expert appointed to monitor the human rights situation in that country. Iran should take note that this year’s resolution had an unprecedented level of support. 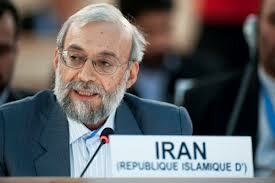 With elections approaching in June 2013, the UN expert’s work documenting abuses in Iran will be even more crucial. The large majority in favor of the resolution also serves to expose the callous disregard Venezuela and Pakistan, the only two states at the Council that continue to oppose any action on Iran’s worsening human rights situation. Please feel free to quote from this message or contact Philippe Dam, HRC Advocate, at +41 76 413 35 36,philippe.dam@hrw.org or Julie de Rivero, Geneva Director, at +41 79 640 16 49, derivej@hrw.org. Nowruz (New Year ) is being celebrated on the first day of Spring ( March 20 )for thousands of years from the time of Zoroasterian ,Achaemenian , Medes and Persian Empire. Today people in Iran, Afghanistan,Tajikestan,Uzbekestan,Kirqizestan,armania (Armanestan), Georgia ( Gorgestan ) , Farsi speaking people of China , Kurdish people in Iraq,Turkey and Syria , Bosnia, Macedonia ,Zoroasterian in India and Pakistan celeberate Nowruz. Iranian Celebrate their New Year on First Day of Spring ( March 20 ) ! As Iranians around the world prepare to celebrate the new year, hundreds of prisoners of conscience remain behind bars in Iran. The Persian New Year, Nowruz, is the most important holiday in Iran, beginning at the moment of the vernal equinox. 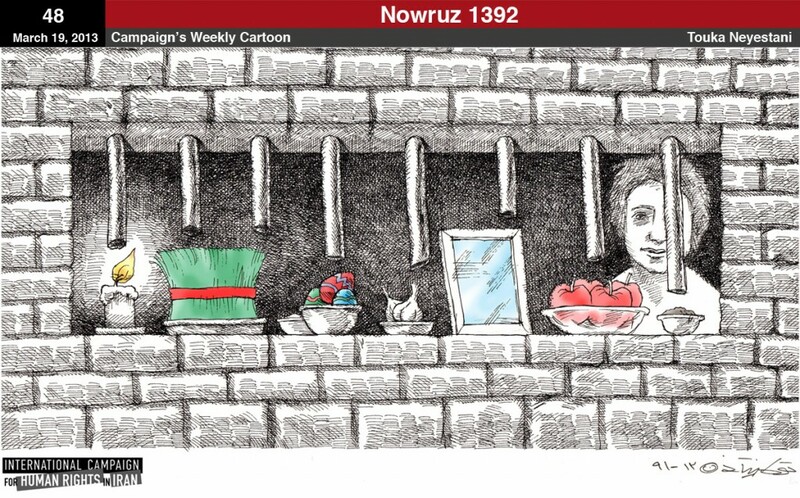 While the news website Kaleme reports that a dozen political prisoners have been granted temporary furlough for the holidays, this year, hundreds of other prisoners of conscience, including lawyers, journalists, activists, and others accused of vague charges for being critical of the Iranian regime, will be left to mark the new year in their prison. What you don't know CAN hurt you! CJFE needs your support. Today is an exciting day at CJFE! We’re happy to announce the launch of our first ever crowdfunding campaign. The Free Expression Review is our annual publication, which provides an in-depth analysis of the state of these rights in Canada. With a report card grading the performance of institutions, governmental departments and public figures, and insightful pieces written by leaders in the field, the Review is an incredible publication, and the only one of its kind produced in Canada. But this year we want to do more! And we need your help to do it. Donate! The Review informs Canadians about how their right to free expression is faring in this country and by engaging them with the critical issues – this is your chance to make sure that happens. It is a big job, and every dollar goes a long way. Tell others! Crowdfunding isn’t based on large donations, but a LOT of donations. Everyone you can pass this on to is one more person who knows about their right to free expression, CJFE’s work, and the importance of holding those in authority accountable. So check out our Indiegogo campaign, and help us take the Review to the next level.
" 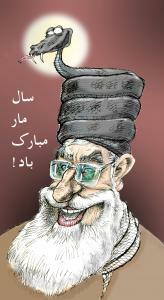 Happy Snake Year " - Cartoon by Iranian Cartoonist Nik Ahang Kosar shows Khamenei Leader of the Islamic Republic of Iran ! Ministry of Information continues The Arrest as we get closer to the Presidential Election in June ! All Eyes on the Events before and after Presidential Election in Iran on June 2013 ! According to news Mr. Hossein Loghmanian MP from the city of Hamedan to the 6th "Majles " (Parliament) during the presidency of Seyed Mohammad Khatami and the head of Mosharekat Party in the city of Hamedan together with four other political reformist were arrested on Saturday.They were on their way to Tehran to meet Former president Seyed Mohammad Khatami when arrested . These four political reformists are: Mohammad Reza Afkhami, Hadi Ehtezazi, Mrs. Rahimi and Amin Faridian. Disorder in Internet before Presidential Election in Iran ! Regime is doing everything it can to stop the flow of information in Iran before the Presidential Election in June .Regime and its Ministry of Information has targeted Journalists, Independent Media , internet and ordered two police forces bridaged and 99 battalion from Basij Forces saty on alert for the coming presidential election in June. Iranian internet users also have no access to chat Gmail , Yahoo Massenger and cant use the Filter breaker and V.P.N. Mr. Ramezanali Sobhanifard an MP in the parliament spoke about the difficulties of 35,000,000 internet user in using the internet . Tehran Governor: 99 Battalion of "Ashura" From the Basij Forces will stay on alert in the Future Election ! This morning Mr. Eisa Farhadi Tehran's Governor in a press conference announced that: "There are 4000 voting branches for presidential election in June and Tehran will take special security measures. In Tehran we will use 15000 police Forces and two police forces brigade also will stay on alert. " He also added that: 99 Battalion of the Ashura from Basij forces will stay on alert on Presidential election day. " Presidential election in Iran is in June and it seems Ahmadinejad has plan for his 25 years long friend Mr. Rahim Mashaei ! As we get closer to June 12,2013 ( Presidential Election day) , More and more we see Mr. Esfandiar Rahim Mashaei in the news, particularly in pro-Government newspapers and websites. Esfandiar Rahim Mashaei and Ahmadinejad are close friend for more than 25 years and he is also father in- law of Ahmadinejad's son. When Ahmadinejad became president ,Esfandiar Rahim Mashahei served as chief manger of presidents office and when Mr. Mashaei with a radical Islamic position ( Hojatieh) took populist position and posed as a nationalist mixing the caliph dynasty of 651 AD with Achaemenid dynasty of 540 BC, many clergies and Ayatollah's spoke and warned about his views and called him with the term " Enherafi " ( meaning diversion ). 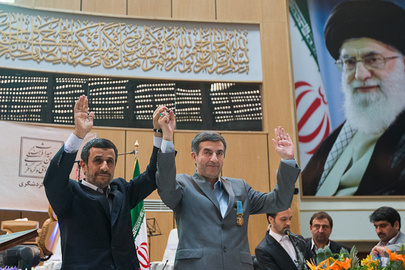 Some clergies blame him for putting influence and making Ahmadinejad to shift from pro Islam and pro clergies into a more nationalist - populist with Latin American style and anti-clergies position.Currently Mashaei serve as head of the office of Islamic Republic on none aligned movement.Today in " National Ceremony welcoming Nowrouz" Ahmadinejad awarded Mashaei with a cultural medal . In this event , Ahmadinejad raised Mashaei's hand and called him as " Spring person" . He said : "Mashaei is a person of Spring,spring,spring and the Nation of Iran were always after Spring". The past events about Ahmadinejad's support for Mashaei and this one brought concern on social circles that Ahmadinejad is endorsing Mashaei's candidacy for presidential election and a kind of Russian post Gorbachev " Putinist " election policy. Mohammad Reza Motamednia in a letter to Khamenei: Let the People of Iran Free and They will show you the Real Rally ! 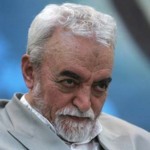 Mohammad Reza motamednia a former high profile person in the Islamic Republic Army during the Iran -Iraq War and former adviser to the military command headquarter and representative of Mohammad Ali Rejaei ( Former president) , Bahonar ( Former Prime Minister) and Mir Hosein Musavi ( former Prime Minister )in mining industries, in a letter to Khamenei criticized the way he is handling the country, controlling everything from military to the appointment of a governor ,interfering in the parliament and...., supporting Ahmadinejad in the disputed presidential election in 2009 and handling the country like the former Shah of Iran. In the letter , he hold Khamenei responsible to the current situation in Iran caused by Ahmadinejad. "The situation of the country is the reason that i wanted to warn you ...... although you do not accept any critical views and you take them as hostility ... in 2009 you knew very well who was right and what Mr. Mir Hossein Musavi was telling. Because you were behind this project..... and as Mr. Saidi said ,the presidential election was " an engineered election" ....... Well Mr. Khamenei , you ,together with other collaborators by ignoring the rights, brought Ahmadinejad into power,.....Now tell us please ,are you guilty and responsible in the current situation of the country or not? ........... Mr. khamenei ,you approve nomination of the head of Judiciary power, the President and the parliamentary Speaker and Assembly of Expert and MP's. You can approve or remove them. Shah Made big mistakes and you are repeating the same mistakes. don't make yourself happy with these made up Revolution day rallies and Government sponsored rallies, let the people free and they will show you, what the real rally is ...... send your agents among the masses and find out how much popular really you are ...... When after the presidential election in 2009 you said: "My opinion is closer to the opinion of president ( Ahmadinejad),you nearly admitted all these current saddened situation. End this self- centered and unlawful deeds which will destroy the country and release Mir Hosein Musavi and his brave wife and Mr. Karoubi and other brave son's and daughter's of this country . I'm not afraid of what may happen to me and that isn't important . I know my voice my not reach to you from your thick walls but i'll write again about the oppressed son's and daughters of this country . More than 30 Iranian women's rights activists held March 8 International Women's Day ceremony in Evin Prison ! Jila Baniyaqoub- Journalist and editor in chief of the "Iranian Women's Association " website . Hakimeh Shokri- From " Mothers of Laleh Park "
Jila Karamzadeh Makvandi-From " Mothers of Laleh Park "
Mir Hosein Musavi and his wife Zahra Rahnavard & Mehdi Karoubi Two presidential candidate of 2009 and leaders of Green Movement in Iran are still under house arrest - 742 Days House Arrest ! Islamic Republic regime in Iran is planning to hold a presidential election without independent journalists ! Security forces of the Ministry of Information almost in every provinces of Iran has assaulted on independent media and independent journalists, journalists have been arrested in mass and detained and some were released with heavy bail and threat of keeping quiet and not getting involved in the coming presidential election.Some of the journalists recently have left Iran for fear of persecution and arrest and imprisonment. 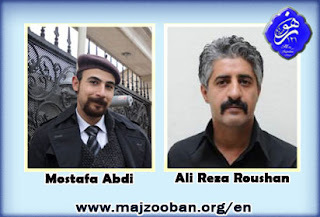 according to a report in the past two days, two Kurdish journalists ( Khosro Kurdpour editor of Mokrian News Agency and Qasem Ahmadi editor of Rojo a student publication ) and at least ten human rights activist were arrested in Iran.Mr. Khosro Kurdpour was arrested by security forces on Thursday at his home and Mr. Qasem Ahmadi was arrested after a summon and attendance at Ministry of Information In the city of Mahabad . Khaled Hoseini, Hamed Mohammad Nejad,Ali Azadi , Vafa Qaderi and Behzad Farajolahi . They were arrested on Thursday at their home and workplace by security forces. regime's security forces earlier also arrested Farzad Samani student activist and his brother Farouq Samani a human rights activist and Rasoul Khazremorovat a cultural activist . (Beirut, March 7, 2013) – Iran’s judiciary should conclude a speedy, independent, and transparent criminal investigation followed by prosecution of those believed responsible for the death of the blogger Sattar Beheshti, Human Rights Watch said today. Beheshti died in the custody of Tehran’s cyber police in November 2012. Iranian officials should stop harassing his family and hampering their efforts to seek justice and ensure that those responsible for the blogger’s death are held to account. Although Beheshti died almost four months ago, there is no indication that the judiciary has concluded the criminal investigation into the officers accused of responsibility for his death, despite promises by officials that the case would be sent to the courts for prosecution before mid-February. Security officials have put his mother and other family members under close surveillance and have told them not to speak to the media or international rights organizations about the case, Human Rights Watch has learned. Officials informed the family of Beheshti’s death on November 6, seven days after cyber police raided his mother’s home at Robat Karim, near Tehran, and arrested him. The police unit, also known as “FATA,” was established in January 2011 to enforce laws aimed at regulating online speech and content considered to violate Iran’s national security or moral legislation. Gohar Eshghi, Beheshti’s mother, told Human Rights Watch that an investigator from the prosecutor’s office visited her at her home on February 2. It was the first such visit to her home. The investigator said he was there to discuss the case, although the family has engaged a lawyer to represent them. The investigator warned Eshgi against speaking to the media or others about her son’s death. He told her the case had been delayed partly because the authorities maintained that Beheshti’s father had not been “of sound mind” when he hired Giti Pourfazel as the family’s lawyer, which Eshgi said is untrue. She said the investigator’s contention appeared to be a delaying tactic to justify the authorities’ failure to deliver on promises they had made to the family about pursuing the legal case. Pourfazel told Iran’s official Iranian Students’ News Agency in February that despite assurances by judiciary officials that the case would be transferred to the courts in mid-February, nothing had happened, and that the relevant authorities had so far failed to provide any information about where the case stands. A parliamentary committee that investigated Baheshti’s death reported on January 7 that Tehran’s cyber police had arrested him lawfully but then detained him unlawfully in an unauthorized and substandard facility. The committee said that evidence from a forensic medical examination of his body indicated that he had bruises on his shoulder, legs, and back, but did not reach a conclusion about the cause of death. It called for the judiciary to conduct a further investigation. Days after the news of Beheshti’s death broke, other prisoners in Ward 350 of Tehran’s Evin Prison, where many political prisoners are held, wrote to the authorities to say they had seen Beheshti before he died and that he had injuries that appeared to have been caused by beatings. In December, amid international concern over Beheshti’s death, the authorities first removed the chief of Tehran’s cyber police from his post and later announced that they had made three arrests. Eshghi told Human Rights Watch that she believes these three are all still being detained. She said officials told her one of them was directly responsible for her son’s death. On February 26, Ayatollah Larijani, the head of Iran’s judiciary, signed new regulations into law tightening oversight over detention facilities operated by police forces. Among other things, the new rules require regular inspections of such facilities by Iran’s State Prison Organization and accurate records of the admission and discharge of detainees. They prohibit interrogations in police stations and detention facilities. A few days later, Tehran’s prosecutor, Abbas Jafari Dolatabadi, announced that new measures would be taken to improve official oversight over detention facilities operated by the police in Tehran province. The special rapporteur expressed concern also about official harassment of members of Beheshti’s family, including physical assaults, during a memorial service on the 40th day after Beheshti’s death. Judiciary Power of the Islamic Republic in Iran called Ahmed Shaheed's report illegal ! the head of human rights office at judiciary power . The statement says : "the content of the report is repetition of his past claims." Mr. Ahmed Shaheeds latest report was released on last Week.Mr. Ahmed Shaheed's report talks about political prisoners ( 150 prisoners) and at least 487 hanging in 2012.Mr. Ahmed Shaheed was nominated by UN human rights council on 2011 and since his appointment he was not allowed to visit Iran by Islamic regime in Iran . Ministry of Information agent continue to Arrest and detain Iranian journalists ! According to Kalameh Website , Mohammad Javad Rooh the editor of Monthly "Mehrnameh " is arrested at his home today .The new wave of Journalists arrest began on Saturday February 26 ,2013. A total of 600 journalists, among them 150 from inside Iran and the rest of them from outside Iran and their networking were hit by unknown soldier of Imam Zaman ( 12th absent Shiite Imam- Agents of Ministry of Information ). Regime's project to arrest Journalists is nothing but to silence them during presidential election and to prevent the flow of information . 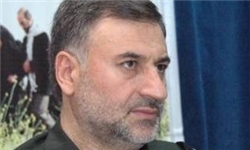 Chief of police forces of the Islamic Republic in Iran: 60,000 "Basiji" & Special forces are ready to prevent any threat ! "60,000 Basiji and special forces are ready to prevent any threat and they are flexible and can move quickly to different locations. Mr. Ahmadi Moghadam called the recent maneuvers of these special forces in the city of Qom and other location as to control crisis and prevention of threats . He added : If Syria had a capable police force,the problems could have been solved in its early stage and there was no need to involve the army." Regime is again threatening Iranian people with its armed to the teeth Basiji and other anti rioting Militia's and getting ready with the upcoming New years celebration of Iranian people on March 20 and the Presidential election on June 12. Mr. Mohammad akhondzadeh representative of the Islamic Republic of Iran speaking in 22nd session of UN Human Rights Council in Geneva . Mr. Akhondzadeh and his team at Geneva session defended Islamic Republic of Iran's record on human rights - Regime's representatives always speaks on human rights of other countries but avoid speaking on the violation of human rights by Islamic Republic on Iranian citizen !